Thanks to Rick Davis for sending these pics to me! 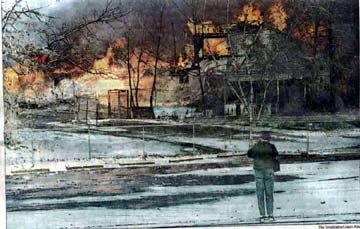 It was a fire that closed Idora Park in 1984. YOUNGSTOWN -- Fire destroyed the Idora Park Ballroom, a Youngstown landmark, this morning. The building was engulfed when firefighters arrived around 10 a.m. Smoke blanketed the South Side neighborhood. Opening day: The ballroom opened June 20, 1910, as the "dance pavilion," 16 years after the park itself opened in 1894. Idora Park closed in 1984, ironically after a fire. 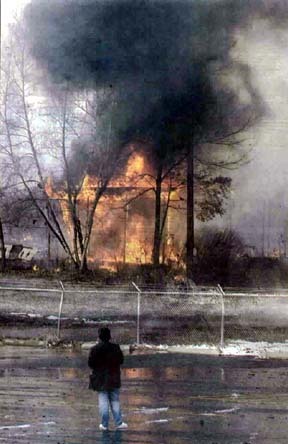 In that blaze, the famous Wildcat roller coaster burned. In April 2000, burn marks found in and around the ballroom sparked more legal action against the owner. Mike Damiano, city demolition director, wrote two tickets citing the park owner, Mount Calvary Pentecostal Church. The property wasn't secured and the ballroom wasn't boarded up properly, he said. He inspected the old amusement park after police discovered signs of open burning inside and outside the ballroom. Officers responded March 28 to neighborhood complaints about vagrants in the building. Ongoing battle: Every time the fence is fixed or the ballroom is boarded up, somebody breaks in again, Matthew Blair, the lawyer representing the Oak Hill Avenue church, said at the time. The church fixes the problems within hours of being notified, he said. Efforts have been under way to preserve the memory of Idora Park through traveling displays and, eventually, a permanent museum at Conneaut Lake Park. Dancers, diners, politicians and the press all went to the Idora Park ballroom. YOUNGSTOWN -- The Idora Park ballroom, a symbol of the city's happier times, is gone. "Idora [ballroom] was mostly the thing for which Youngstown is most known," said former owner Charles "Mickey" Rindin of Youngstown. "There's nothing that can replace it." A fire Monday morning deemed suspicious by authorities reduced the ballroom to ash in a matter of minutes. Only two worn concession stands, the Jack Rabbit roller coaster and a portion of the Wildcat roller coaster remain at the former amusement park, Rindin said. Another former owner, Leonard Cavalier of Youngstown, said that as he travels the country, people remember the ballroom or the rides. "It has a lot of memories for a lot of people," Cavalier said. A big part of park: Rick Shale of Boardman, co-author of "Idora Park: The Last Ride of Summer," said that while other symbols of Youngstown remain, such as the Butler Institute of American Art, the ballroom could claim to be Idora Park's heart and soul because so many events at the rest of the park also involved the ballroom. Trolley lines that were extended after the park opened dropped off visitors right in front of the ballroom, he added. Idora Park closed in 1985. "All we have left are happy memories," Shale said. Many of those involved romance. Robert Pugh of Boardman came to watch the fire with his wife, Virginia. They had visited the ballroom several times while they were dating. "It's just a shame," Robert Pugh said. Rindin estimated the dance floor could hold as many as 2,500 dancers, and just as many people for dinner. Rindin said he knew of no place in the area now that could seat that many at one time. Shale said it was one of the largest dance floors between New York and Chicago. Preserved in book: Much of that history has been preserved in Shale's book, while some park materials were donated by Cavalier to The Arms Museum of the Mahoning Valley Historical Society. The ballroom was built in 1910, although dances at the park went back to 1899, Shale said. In recent years, however, the ballroom was becoming more dilapidated, although Shale said it was the only thing of any value left at the park. Fire Chief John J. O'Neill Jr. could not put a value on the amount of damage. The ballroom had a market value of $119,000, say records at the Mahoning County Auditor's Office. Records also show the 26 acres comprising the former park have a market value of $286,700. The land is valued at $155,100, and all the property is valued at $131,600. The city has cited the owner, Mount Calvary Pentecostal Church in Youngstown, in the past for failing to secure the ballroom, but a church representative had said people kept breaking in. Vagrants or vandals kept setting fires in and around the ballroom. Prediction came true: O'Neill said of the ballroom last year, "Sooner or later, the worst case is going to come of that. It really scares you. It would go up like a matchbox." It did. The fire department received the call at 9:51 a.m. Monday. The fire department responded with all but one of its trucks. By 10:15, the center of the ballroom was engulfed and by 10:35 a.m., the building was all but gone. Firefighters kept the blaze from spreading to the nearby Jack Rabbit. Alvin Ware, a city arson investigator, said he may know the cause by today. Ware and O'Neill said the fire was suspicious, but neither saw any obvious sign of arson. Richard Scarsella, director of the Idora Park Institute, was at the scene and said, "This is literally history going up in flames before our eyes." Didn't come to fruition: Various efforts to preserve the park and its structures never came together. Rindin said the ballroom needed work but could have been restored. Efforts to sell the Jack Rabbit and the remaining portion of the Wildcat to Conneaut Lake Park in Pennsylvania fell through in 2000. Jason Whitehead, corporate administrative manager for Mount Calvary, said no one else has made an offer for the rides. Mount Calvary has long planned to build the City of God spiritual center at the former park. Whitehead said the concept was still active but he was unaware of any activity. The church's Bishop Norman L. Wagner was out of town and unavailable to comment on the church's plans, said Whitehead, who added the bishop was "very saddened" by the fire. The church is $6,777 behind in its real-estate taxes on the park. It wasn't clear if the church was making payments. Current taxes of $2,824 are due Friday. The asbestos poses no health hazard as long as it stays wet, an asbestos coordinator said. YOUNGSTOWN -- Mount Calvary Pentecostal Church is responsible for the costly cleanup of asbestos at the former Idora Park ballroom, city officials said. Mike Damiano, the city's deputy director of demolition and housing, and Larry Himes, asbestos coordinator for the Mahoning-Trumbull Air Pollution Control Agency, said they will send letters to the church detailing what must be done. Damiano said he was going to press for quick removal of the debris left by Monday's fire, which destroyed the ballroom, built in 1910. Mount Calvary acquired the park in 1985. "I'm not going to let this go on for any length of time," he said. The church will have until April 1 to begin cleanup efforts, Damiano said. Damiano said that if the church can't afford the cleanup, it would take his department's entire annual budget to do it. Safe removal: Himes will notify the church about the steps that must be taken to safely remove the debris. His agency oversees enforcement of U.S. and Ohio Environmental Protection Agency air pollution rules. The Youngstown landmark contained 24,000 square feet of asbestos ceiling material, which provided good acoustics for the bands that performed there. The asbestos is now in the debris. There's no health threat as long as the material stays wet. "If that [material] sits and dries out, there is potential of fiber release," said Himes. "It can sit for a certain amount of time. But if it dries out, then it will really be a problem," Damiano added. No more help: Fire Chief John J. O'Neill Jr. said he is unwilling to have the fire department continue to hose down the rubble to keep it wet. "I think the owner should be responsible for that. We've asked them to be responsible for that building all along. Our equipment is for emergencies -- not for that sort of operation," he said. The church will have to hire a contractor certified in asbestos abatement and removal to take away the debris, which will have to be kept wet during removal, Himes said. All the material must be taken in covered or enclosed trucks to a landfill that can accept asbestos. A containment area also must be set up to wash asbestos from the steel in the structure before it is sold for scrap. The church also will be told to immediately put a fence around the debris, Damiano said. Vagrants inside: Vagrants had recently been living in the basement of the ballroom, which is where the fire started, said Alvin Ware, the city fire department's arson investigator. In the past, there was evidence of fires set inside and outside the building, and city officials had feared exactly what has happened. To avoid the problem, the city recently sought quotes on removing the asbestos while the ballroom was standing. Prices ranged then from $110,000 to $150,000, but they now now could run between $200,000 and $300,000, Damiano said. That could be more than the value of the entire park. Mahoning County Auditor's Office records show the 26 acres of the former Idora Park, the ballroom, and the other properties had a market value of $286,700. The ballroom itself was valued at $119,000. The fire department indicated the loss of the building was $500,000 -- a figure O'Neill said was based upon "a mix of its actual value and historical value." Ware said the church has not responded to calls on whether the property was insured. Councilman reacts: Councilman Michael Rapovy, D-5th, told his colleagues Wednesday that it's imperative for the church to launch "an immediate cleanup" of the site and arrange for immediate demolition of the remnants of the Wildcat roller coaster and two adjacent structures. "If that Wildcat were to catch fire right now, with the woods right next door to it in Mill Creek Park, we'll have a loss that we've never seen before in Youngstown," said Rapovy, whose ward includes Idora Park. Himes said there were no state or federal cleanup funds readily available. In some cases, a city has seized property in return for undertaking cleanups, Himes said. "It's still open, suspicious, and under investigation. We're definitely looking for any witnesses we can find, anyone that saw anything suspicious," O'Neill said. Anyone with information about the fire is asked to call the arson bureau at (330) 782-0055.